In a space formerly occupied by a Chinese bookshop, east of the Millennium Gate and across from an old Chinatown institution, Foo’s Ho Ho, sits Bestie. Inspired from the German snack of Currywurst, this small shop sells various kinds of sausage smothered in curried ketchup. Although, the eatery’s star attractions are the wursts, I found Bestie also serves very well executed salads. Over two visits, I was able to try three different veggie concoctions. Bestie likes to switch up the salads they offer on the menu, so what you may find on the menu may not be what I describe below. The chilled Roasted Cauliflower salad also included sweet honey and raisins, herby flat leaf parsley, and crunchy slivers of red onion. Cumin was sprinkled on top but was only faintly tasted in the salad. The Cool Ranch Beet Salad had crunchy cucumbers, tart green apples, spicy radishes, along with the star sugary red beets. A dill spiked creamy dressing completed the salad. The special Red Cabbage and Bean Sprout slaw, featured julienne carrots, cucumber skins, cilantro and mint. All the crispy shards of vegetables were tossed in sweet and sour vinaigrette. All 3 salads had a variety of tastes and textures. The ingredients of each offering worked well together yielding interesting flavours and were pleasant to eat. Each of the salads were refreshing, balanced and were a nice counterpoint to the sausage. 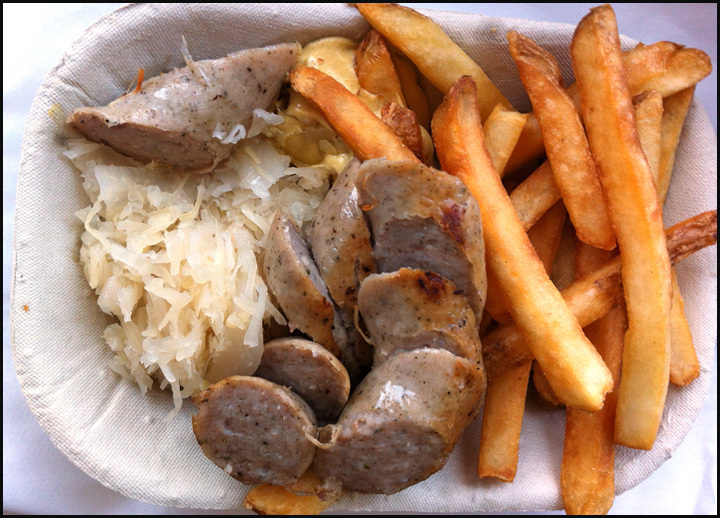 At Bestie you can select from 4 types of sausage to eat, in either the Currywurst plate or the Sausage & Sauerkraut plate. Both plates come with fries that were crispy on the outside and fluffy on the inside. First, I tried the Classic Pork Thuringer in a Sausage & Sauerkraut plate. The pork filling was smooth yet dense and encased in a snappy casing. Each bite was bouncy with hints of pepper and strong meat aftertaste, which actually reminded me of Vietnamese Pork Meatballs. Overall I liked these bite size morsels. 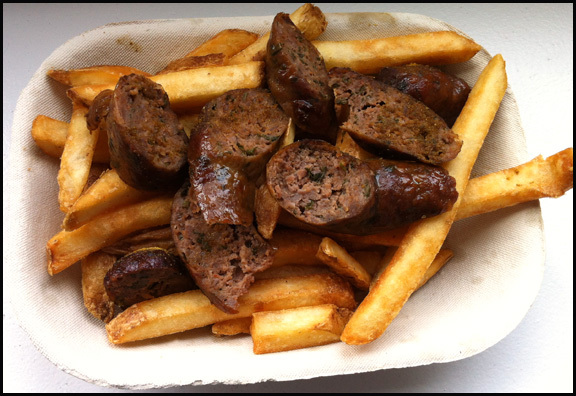 On a return visit I opted for the Smoky Bison sausage in the Currywurst plate. Bison is a very lean meat, that can dry out very easily. I curious to see what texture the Smoky Bison would have. Much like the Pork Thuringer, the sausage had a snappy casing. The meat within was moist and had a much more meaty flavour than the Pork Thuringer. A bold smoky flavour also permeated each bite. I think I prefer this Bestie sausage as it has more pronounced flavours. The salad and sausage were delicious but the thing I enjoyed the most at Bestie was their curried ketchup. 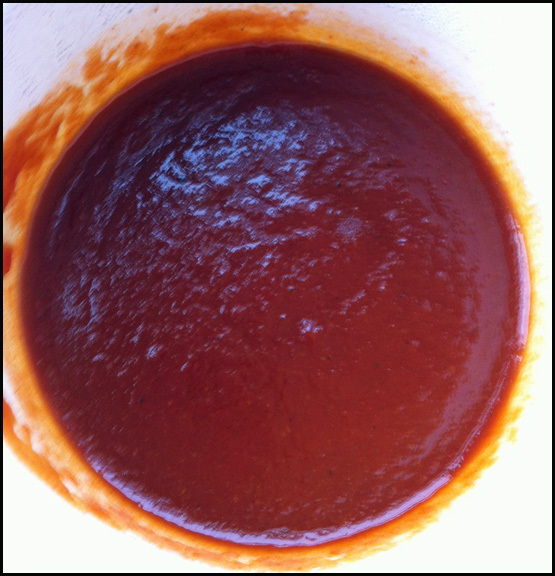 It’s a condiment simply made by combining curry spices and ketchup, but I found it addictive. Like a metronome’s steady hand, I found myself grabbing a French fry, dipping it into the spiced ketchup and then raising into my mouth. In an even rhythm, I repeated the process: fry, ketchup, bite, fry, ketchup, bite. I only stopped when I realize I had eaten every fry in my order. I really enjoyed the food at Bestie. The portion served make it fitting for a light lunch, especially if you get a salad and a sausage, or a pre / post dinner snack. 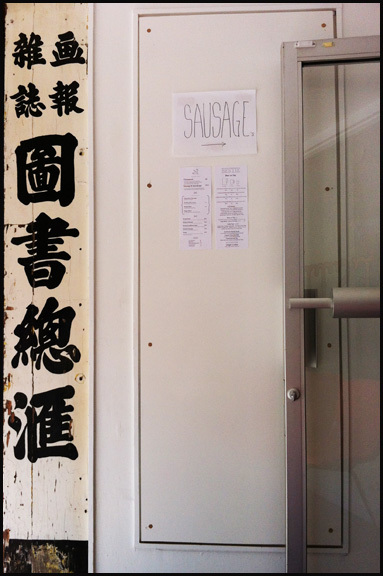 This little Currywurst shop has breathed some life into the area as it certainly has attracted younger faces to the southern point of historic Chinatown.